A ceiling is one of the most overlooked elements of the interior designs in your home. 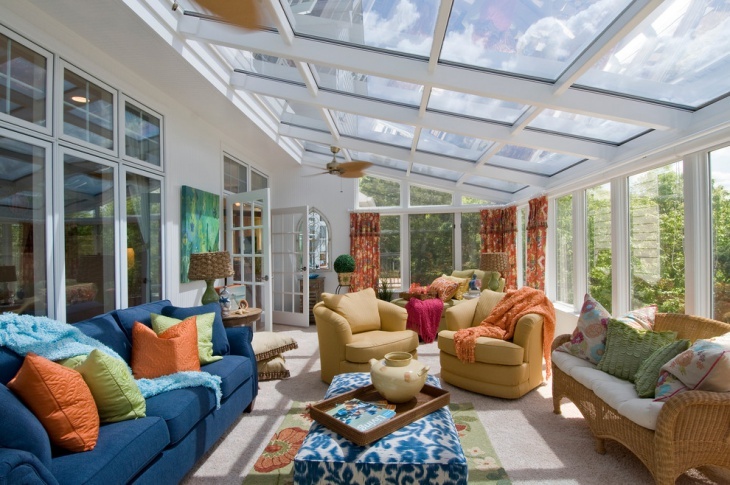 When you think of a sunroom or patio, you can customise the outdoor ceilings to perfection. These need not be flat with a white attire. 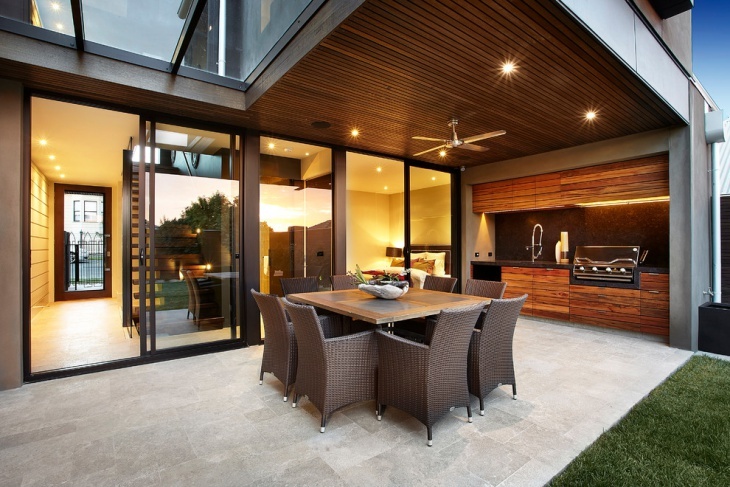 You can incorporate proper outdoor lighting with innovative ceiling design ideas to get a stunning combination. Well, you can be quite experimental with the outdoor ceiling design ideas. 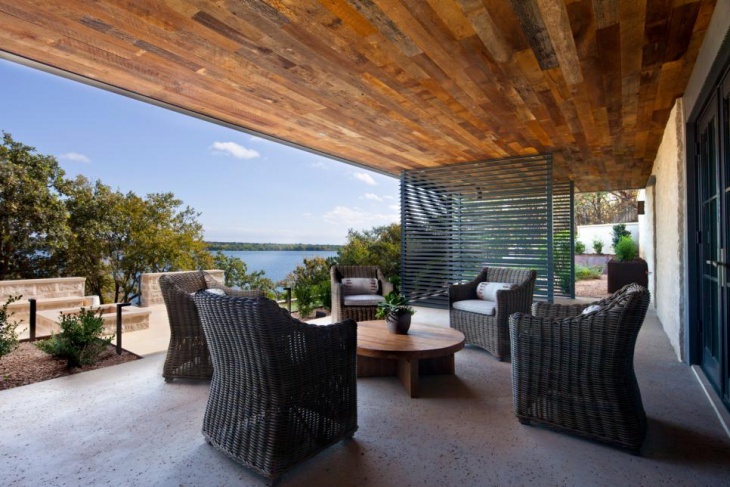 Here, you will find ten classy outdoor ceiling design ideas that will definitely live up to your aptitude. 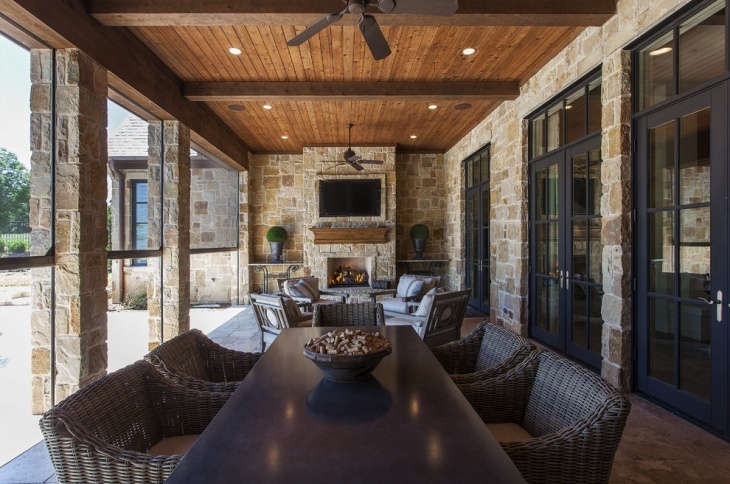 A rustic wooden ceiling creates an elegant setting in outdoor rooms. Black frames for the windows screened black porch under the deck and a rustic stone finish in your outdoor chamber makes a perfect blend. There are several elements in the room, ranging from wooden ceiling to large glass panes. Fix a traditional ceiling fan from a wooden beam to enjoy perfect settings. 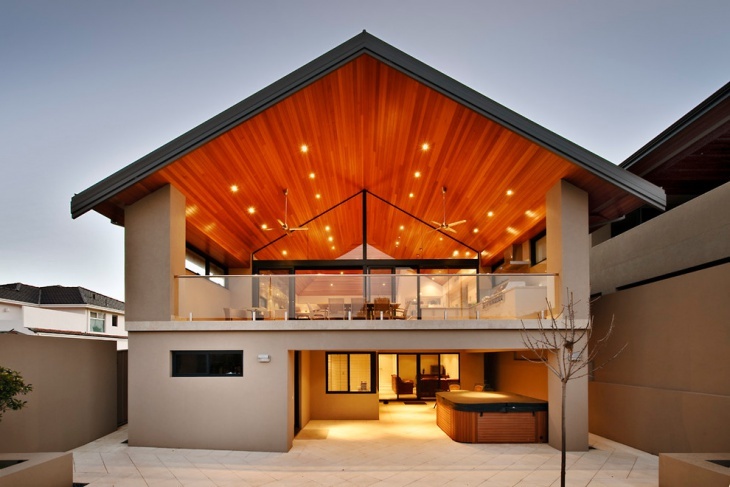 Wooden ceilings are inherent with elegance. 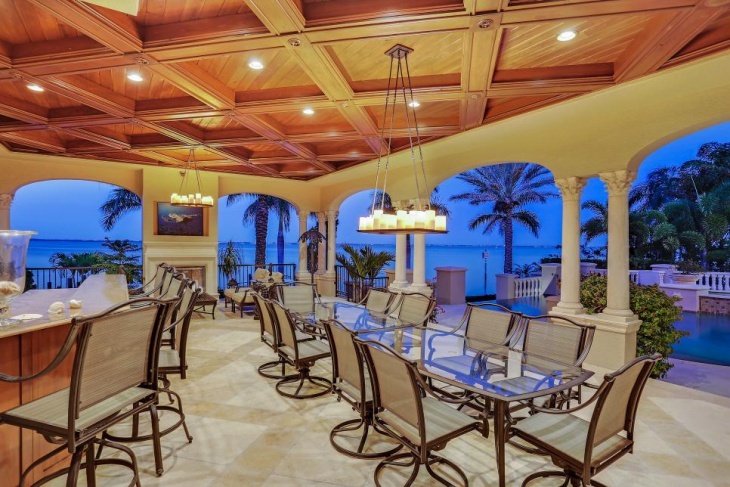 This can be the perfect Dining Room ceiling for you. 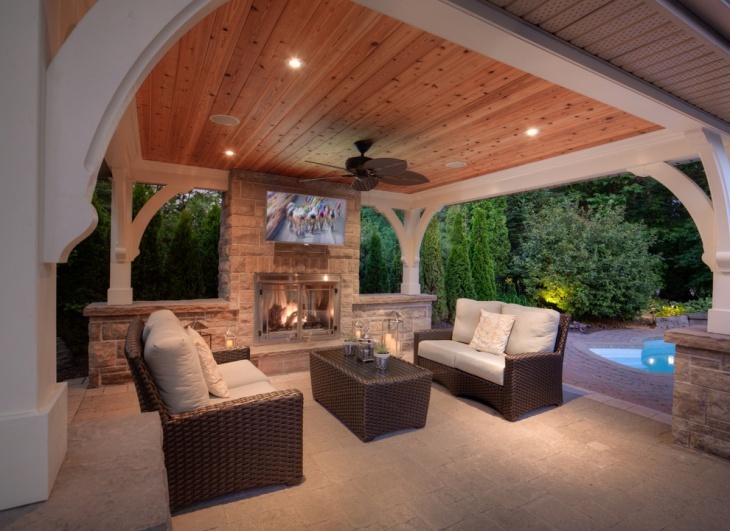 When you incorporate the wooden ceiling idea in your backyard patio or bar, make sure that the wooden door frames have a perfect combination with it. Large glass doors make the room further sophisticated. Get light colored furniture and flooring for the closed patio. People like to blend different materials in the outdoor areas. Here, you will find a perfectly contrasting light and dark shades of brown in the ceiling. There are stone-finished pillars in the room, which enjoy a perfect match with the stained wooden ceiling. 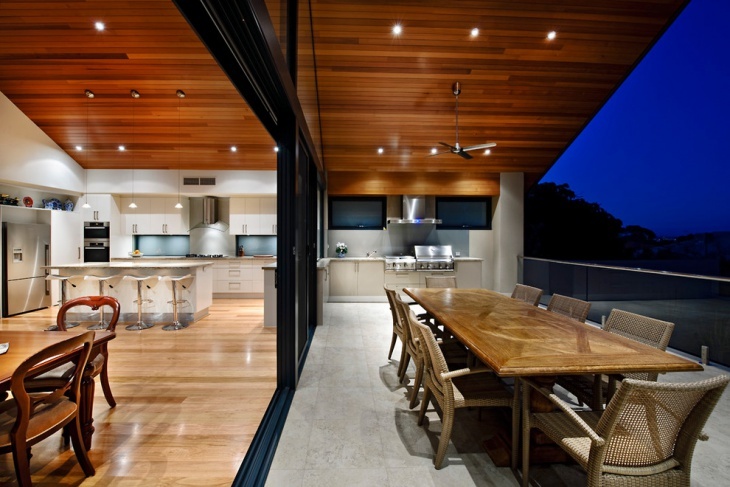 Get a wooden floor that complements the ceiling. 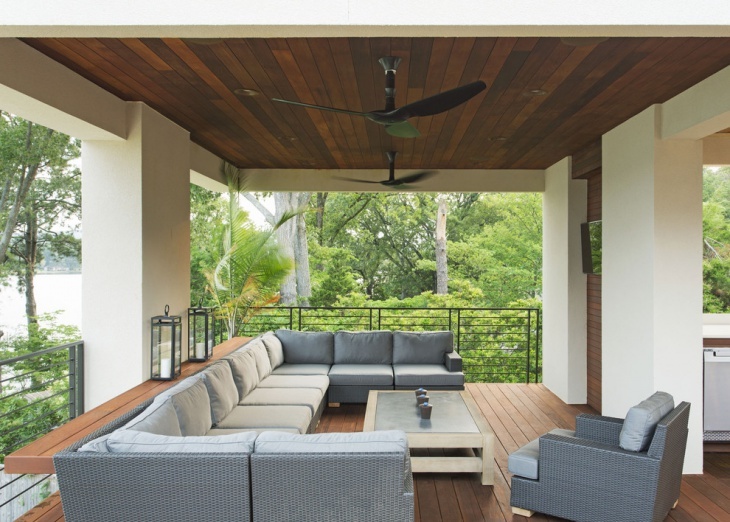 Houses with open outdoor decks with inbuilt grills look splendid with a sleek, wood-finished ceiling. 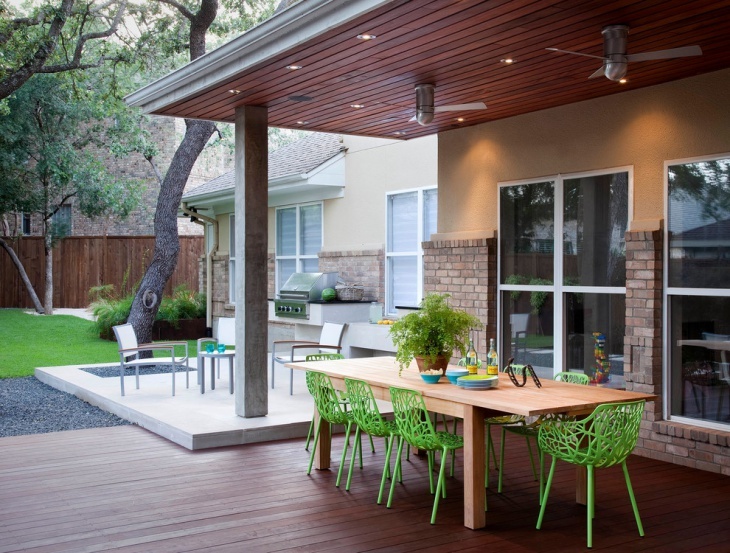 There are narrow strips of wood in the ceiling, which complements the light wooden table and green outdoor chairs. A matching floor makes the place unique, and stone base of the walls go well with the tinted glass panes. 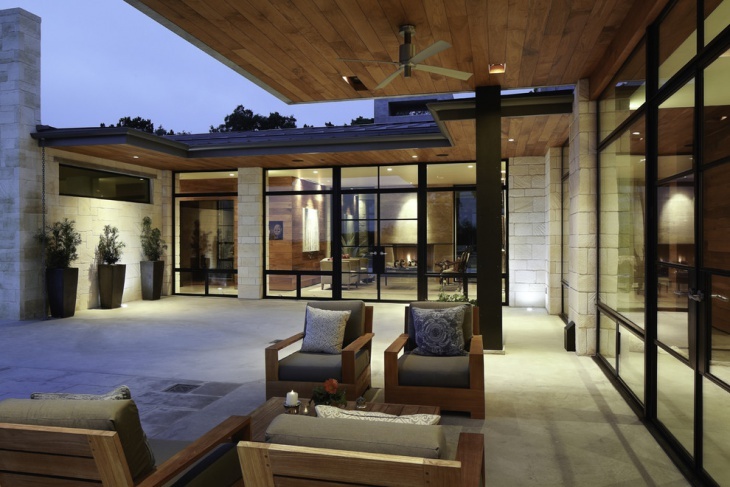 Outdoor patios with a stone-finish need a right blend of wooden architecture to complement itself. The branched wooden beams are tinged with a reddish-brown colour, which is ideal for the bright flat wooden ceiling. 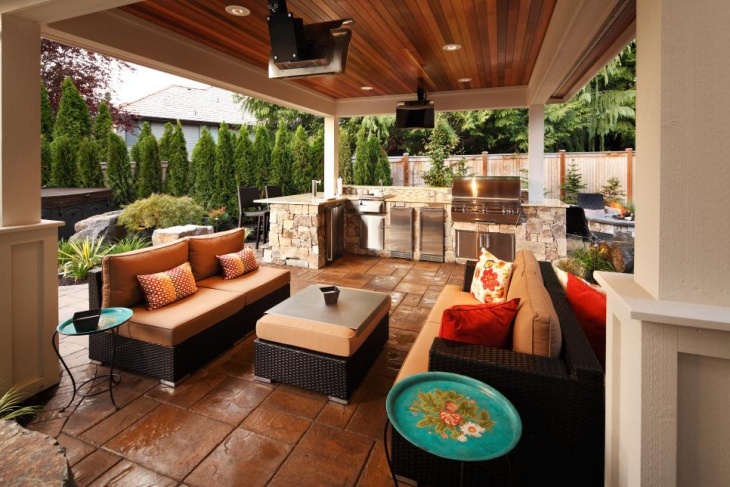 Stone pavers are sued for the floor, and the stone grill has the perfect match for the patio. Timber ceilings look royal and sophisticated when they come polished in the right shade. In this setting, the wooden ceiling is furnished with a warm shade of brown. It complements the sleek dining table with a lighter shade of brown. Incorporate black frames around the glass panes to yield a stunning combination. When you look out for a change in the architectural design in the patio ceilings, you can opt for the cathedral ceiling idea. There are beige walls in the room, and a large deck complements the look. The sloped ceiling is made of bright wood, and there are golden-yellow pendant lights in the room with cathedral fans. 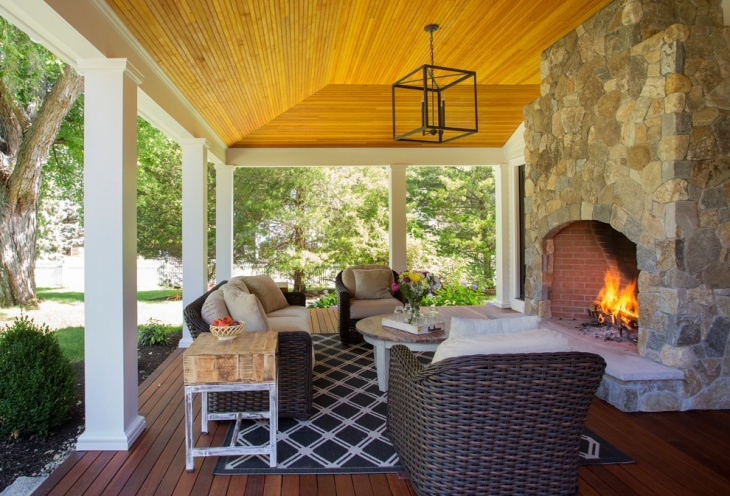 You can achieve a splendid look for the outdoor porch when you opt for a cedar ceiling. There are dark spots in the wood to make the beauty pronounced. 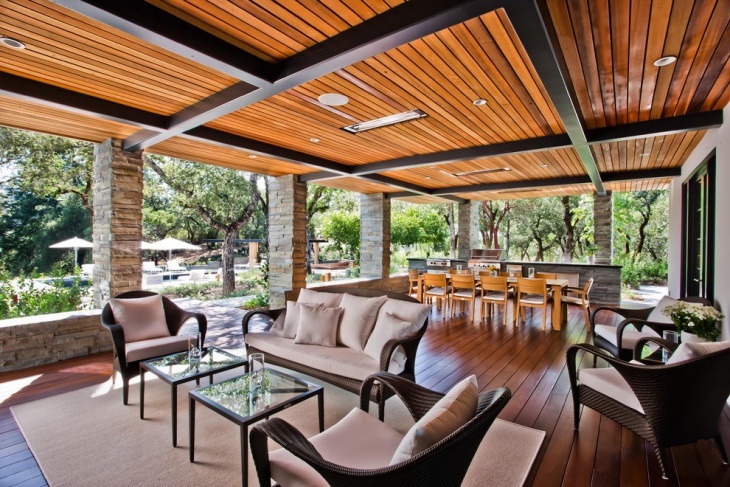 Thick wooden beams, white in color supports the ceiling and this adds to the grandeur of the patio. Get in touch with a tropical bronze ceiling fan for the ideal combination. 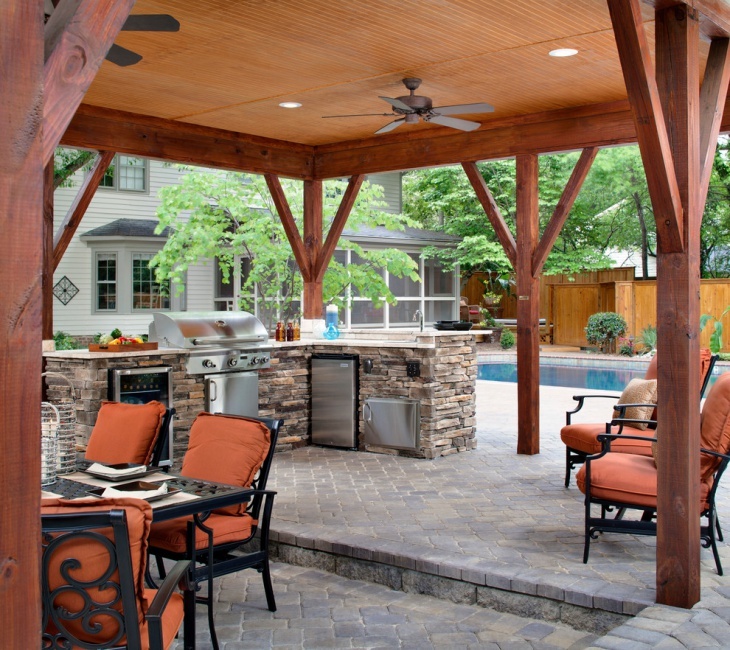 A cottage-styled ceiling goes well in outdoor patios that are designed to resemble farm houses. The yellowish-brown color of the ceiling enjoys a great compatibility with the stone fireplace. To create a matching contrast, you can paint the pillars in white, which yields a good look in the wide-open patio. Apart from these, these ceilings can be customised for outdoor playhouse as well. 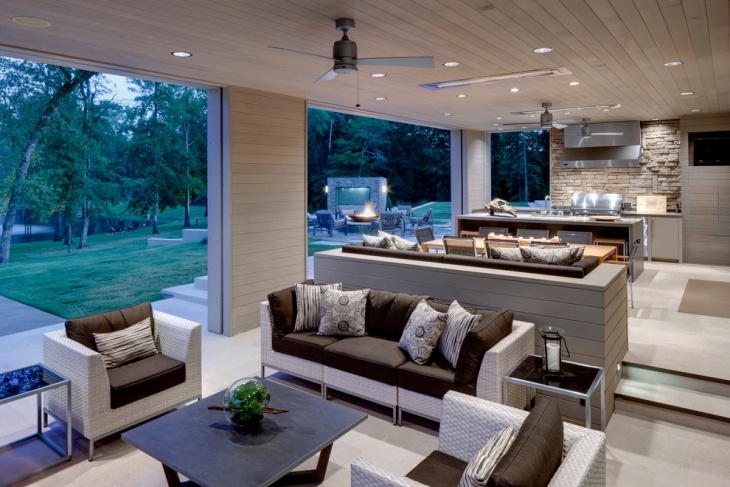 When you incorporate the outdoor ceilings in your homes, you need to consider the amount of natural light in the room, the color of the walls and other necessary factors. Apart from the designs mentioned above, you can innovate your own ideas as well. Let us know about the ideas you come up with.